Fleetwood Mac News: Fleetwood Mac frontwoman Stevie Nicks calls the whole #AmericanHorrorStory experience a "gift." Fleetwood Mac frontwoman Stevie Nicks calls the whole #AmericanHorrorStory experience a "gift." what Stevie will be singing on tonights show. 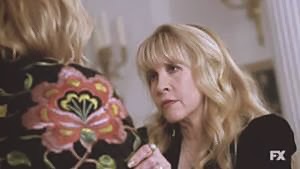 Stevie Nicks' music has been a part of hit series American Horror Story: Coven from the beginning, but Wednesday night's episode actually features an appearance by Stevie herself. In addition to acting in the episode, she performs two songs, and the Fleetwood Mac frontwoman calls the whole experience a "gift." American Horror Story: Coven focuses on a group of witches in New Orleans, and one of them, Misty Day, is obsessed with Stevie. Since the singer was friendly with the show's creator, Ryan Murphy, from her visit to the set of his other series, Glee, she gave permission for him to use her music on Coven early on. And while Stevie tells ABC News Radio that she was initially a bit shocked at how dark this show is, she's been thrilled at how her music has been used to highlight Misty's personality. "She listens to my music. She looks at me as an adviser, as a person who makes her feel better when she's miserable," Stevie says of Misty. "She doesn't have any friends. I'm her only friend. I got that immediately...And I love it, because a) I love the story, and b) she's gonna take my music to people who've never heard it. I mean, that's a two-for-one for me!" From there, it was only logical that Stevie herself would appear on the show. On tonight's episode, according to Murphy, Stevie, playing herself, will be introduced to Misty by the head witch, Fiona, played by Jessica Lange. But Stevie says she was shocked at first when she arrived on set and realized that she was actually being expected to, y'know, act. "I thought I was just gonna do, like, a walk-through in a long black dress and really high heels...hair blowing, and I was just gonna walk through and go 'Good evening, witches! Lovely to see you! Goodbye!'" laughs Stevie. "I thought I was just going to be like a vision that just came in and went out, in that big, beautiful white house. Well, not so." After realizing the extent of her involvement int he episode, Stevie says she was "very nervous" at the prospect of sharing scenes with Jessica Lange. "I'm not good at remembering lines," she explains. "I can remember songs that I wrote, because I wrote 'em, but I'm not good at remembering stuff. So, I was terrified I wasn't going to be able to do it." But, she says, "When we got in there...they just throw their arms around you. And they make it as easy for you as possible." As for the singing, Stevie performs "Rhiannon," and "Has Anyone Ever Written Anything for You?" "The songs...fit right into Ryan and [co-creator] Brad [Falchuk's] crazy twisted story," she laughs. "It was really fun for me because I felt like I got to do my own little mini concert, and they were all my captive audience...they couldn't move, y'know? They had to be!" Overall, Stevie tells ABC News Radio, she loved the experience. "I feel a part of that house now, and I feel a part of them. And it's really, it's really marvelous. It's really been a gift for me to have been asked to do this," she says. Despite appearing in the episode, Stevie still hasn't seen it yet, and she plans to watch it tonight, just like all of us, except she's going to watch it after she finishes up her last concert -- for quite a while, anyway -- with Fleetwood Mac. "Right when I walk on stage is right when it comes on," she tells ABC News Radio. "So I'm flying from Phoenix to Las Vegas, doing our very last Fleetwood Mac show, and then flying back...so I'll watch the show at about three in the morning." Sounds about right for a show as dark and creepy as American Horror Story: Coven. It airs tonight on FX. Australia and UK... Coven airs on Jan 13th and Jan 14th in your countries.